I know what some of you may be thinking. No, this smoothie won’t get you buzzed. This is the first smoothie recipe I’ve posted containing hemp; so let’s take a look at why hemp is a great addition to your smoothies. For your smoothies, you can purchase hemp protein powder or shelled hemp seeds. The seeds are mild with a slight nutty flavor. Besides smoothies, hemp seeds are also good in salads and homemade trail mixes. This is a simple hemp smoothie recipe – feel free to incorporate some of the suggested add-ons or anything else that sounds good to you. Enjoy! 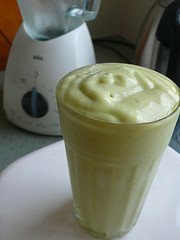 I would love to know if you try this banana hemp smoothie – please leave a comment below. Happy Blending! Thanks for the recipe. Cinnamon and honey are good additions. I just tried it and yes it’s lovely, if anything a bit sweet for me so next time I’ll leave out the stevia. Thanks for the recipe idea! You’re welcome, Emily. Nice to hear you enjoyed, even if a bit sweet. I hate the taste of some hemp powder I bought so tried this recipe, and it was great. I swapped the green superfood powder for a good sprinkling of cocoa nibs to give it a wonderful chocolate banana combo taste. Beautiful, Michael! When I first started making smoothies years ago I tried a hemp powder protein and it was the grossest thing ever. I drank it down because I’m super stubborn, but man it tasted bad. Chocolate goes well in every smoothie, IMO. Lovely smoothie, repairing my body after a gruelling weekend! I added a little powdered ginger for extra goodness as well as a little kick. Powdered ginger, very nice add-on, Terry. Cheers! I just had a papaya, banana and hemp smoothie with light milk and stevia. It was awesome! This with peanut butter. Yum! Peanut butter, very nice add-on, Rhnee! My mother had to have her entire stomach removed because of cancer, and this information is a life saver for her smoothies! She can’t stand the taste of artificial sweeteners, which are in all commercial protein powders. She can drink this smoothie, and likes your chocolate chia smoothie too! Thanks so much! You’re welcome, Donna. Nice to hear your mother found a few smoothie recipes she likes. Artificial sweeteners be gone! Honey, maple syrup, and occasionally stevia for me. So good! I added one extra banana and a few ice cubes! One of the best I’ve had! Thanks for sharing! You’re welcome, Cara. Nice to hear you enjoyed this smoothie with an extra banana and ice cubes. Wonderful! We’ve been working on smoothies all summer so that we can get a quick healthy start once school started and our 13 and 14 years has given this thumbs up, cool and o ooh that’s good. It’s easy and they’ve had it twice this week. Well be looking for more easy smoothies. Thanks a great way to start the day. Music to my ears, Elaine :) Smoothies are the epitome of quick and healthy. Your kids will be soaking up information like sponges when fueled by healthy smoothies. There’s plenty more easy smoothie recipes on my site. Just bought hemp seeds for the first time today and tried this smoothie tonight (didn’t have green powder so I added two handfuls of spinach). My husband and I both LOVED this. Tks! You’re welcome, Melissa. Nice to hear you and your husband enjoyed this smoothie. Does the nutritional information include the add on ingredients? The nutritional information does not include the add-ons, Jenn. Trying it as I type. I LOVE IT. Next time I won’t add honey, it’s kinda sweet for my taste which is weird because I have a sweet tooth. Thanks for sharing this recipe, it was delicious! I also used the add ons. I didn’t have any green superfood powder so I substituted cacao. You’re welcome, Darla, nice to hear you enjoyed this recipe. This smoothie was so yummy……I used vanilla almond milk, and the maple syrup with mine….made the taste of the hemp protein taste so much better!!! Very good, Alison! Sounds delicious with maple syrup. That’s not too much, Cynthia. Sounds delicious! Hi , I’m glad I’ve found your site and this recipe, I’ve not tried yet but will tonight, I’ve too tried straight hemp protein powder and it nearly makes me barf. I would have thought the protein content is much higher? Straight protein powder likely has more protein than the whole seeds, but not that much and certainly not worth forcing down.